Groundbreaking techniques of time-lapse, microscopic and underwater cinematography are on display in this collection of films exploring animal, plant and insect life. The natural world has always inspired fascination. Secrets of Nature, a pioneering series exploring animal, plant and insect life, made wondrous worlds and natural processes visible for the first time: sweet peas unfurl in the sunlight, white owls swoop in on their prey, sea life lurks on the ocean floor and moths patiently spin their cocoons. These films, made by enterprising men and women at the forefront of science and nature filmmaking, developed groundbreaking techniques of time-lapse, microscopic and underwater cinematography. 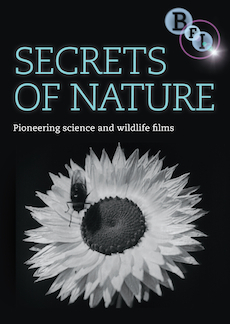 Paving the way for the natural history programmes that we know and love today, these Secrets grant us an entertaining, absorbing and very special glimpse into the mysteries of the natural world. The techniques – Fathoms Deep beneath the Sea (1922), The Plants of the Pantry (1927), Magic Myxies (1931), The World in a Wine-glass (1931), Romance in a Pond (1932), Brewster's Magic (1933). Percy Smith with Herons (1921, 3 minutes), an extract from Urban Movie Chats series: one of nature filmmaking's pioneers in the role of adoptive father.